When I first heard of the new Hermessence collection, with its ouds and myrrhs, I was apprehensive. The previous additions to the line were all sheer, opaline and ethereal, and I couldn’t see how Middle Eastern inspiration could continue the same aesthetic. As it turns out, I underestimated Christine Nagel, the current in-house perfumer for Hermès, because Agar Ebène, Cèdre Sambac, Myrrhe Églantine, Cardamusc and Musc Pallida have the radiance that gives the house’s perfumes its distinctive quality. They also have curves and sensuality. 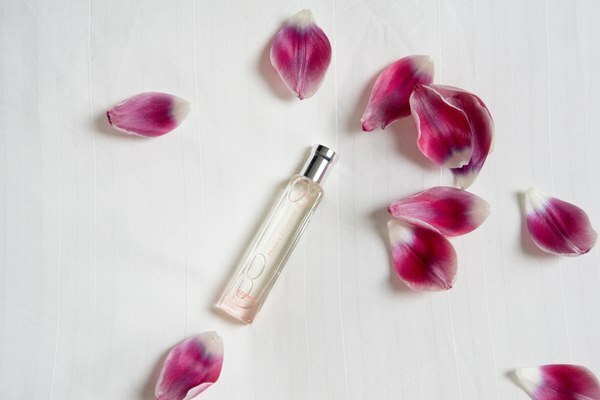 Myrrhe Églantine is the most classical of the five new Hermessence fragrances and the one that pays the most homage to an existing perfume, Rose Ikebana. Created by Jean-Claude Ellena, Rose Ikebana was one of the most underrated gems from the collection. Yes, it’s a pretty, fizzy rose, but it also had a level of precision and refinement that few other fresh roses possess. Myrrhe Églantine plays with the same shimmering effects, but it sets the rose against a velvety background. Spring is the time when I crave to make a change–and when it seems that anything can be possible. I make plans to visit new places, learn new things, read more widely, research a completely new topic like Renaissance cuisine or Leonard Foujita’s paintings or the poetry of the late Tang period. I similarly want to push my horizons with new scents. A chord of violet powder and rose petals, Niral starts as a flower fit for a Victorian corsage, but beneath the softness and candied violet sweetness lies the darkness of sandalwood. A cool touch of angelica, one of the materials that currently intrigues me, gives a sleek shape to this opulent composition. A blood relative of Mohur, the other plush perfume from Neela Vermeire’s line, and also of L’Artisan Parfumeur Traversée du Bosphore. Created by Bertrand Duchaufour, who is able to interpret the French-Indian vision of the house’s founder without recourse to cliches. As preparation for the Art of Perfume and Wine class that I’m teaching in April in France (more details here), I thought I would write about 7 vintage perfumes that have been influential for the evolution of perfumery and that we will smell in their original versions. There will be over 50 different perfumes in this course, but these 7 are among the most essential to learn. Many perfumers will name Guerlain as the most influential perfume house, especially in its period when Jacques Guerlain was the head creator. L’Heure Bleue is a textbook example of a classic as well as of a symphonic perfume. We will, of course, smell other Guerlain classics, from Après L’Ondée and Mitsouko to Chamade and Chant d’Arômes.